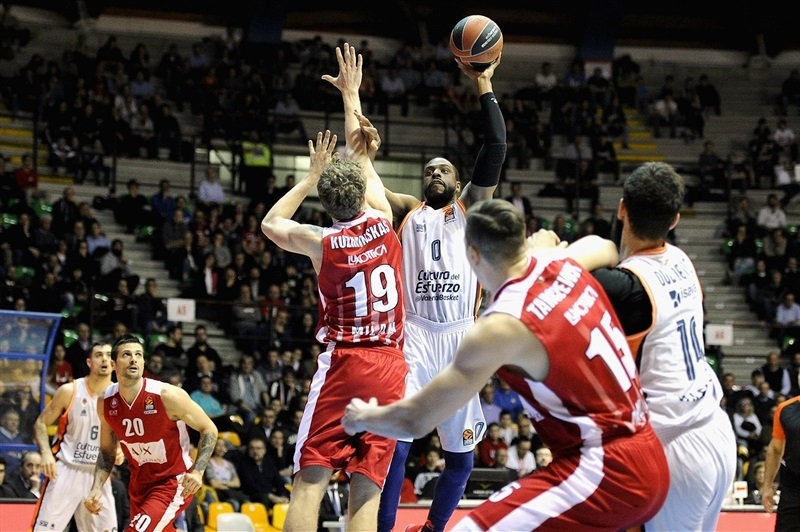 In an entertaining clash of two previously-eliminated teams, Valencia Basket went on the road and held off AX Armani Exchange Olimpia Milan 89-93 at PalaBancoDesio in Desio, Italy. 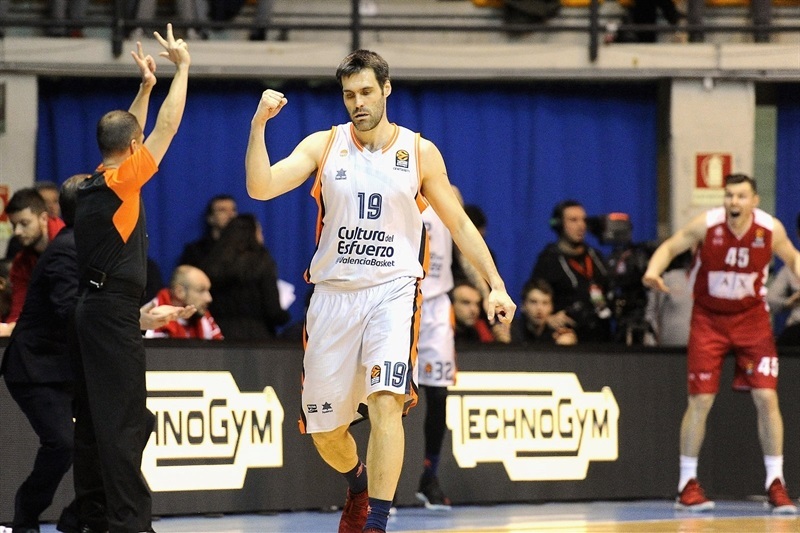 Valencia improved to 11-17 and Milan dropped to 9-19 with two games to play. It was a game with offenses in good rhythm and teams shooting well from long range, with Valencia making 12 of 25 triples and Milan 14 of 29. 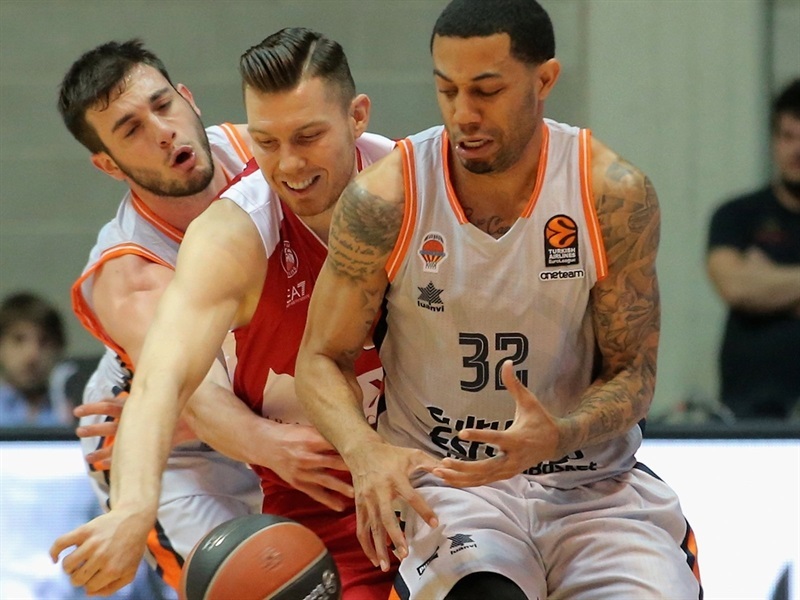 The visitors led 74-85 lead midway through the fourth quarter, but Curtis Jerrells rallied the hosts. 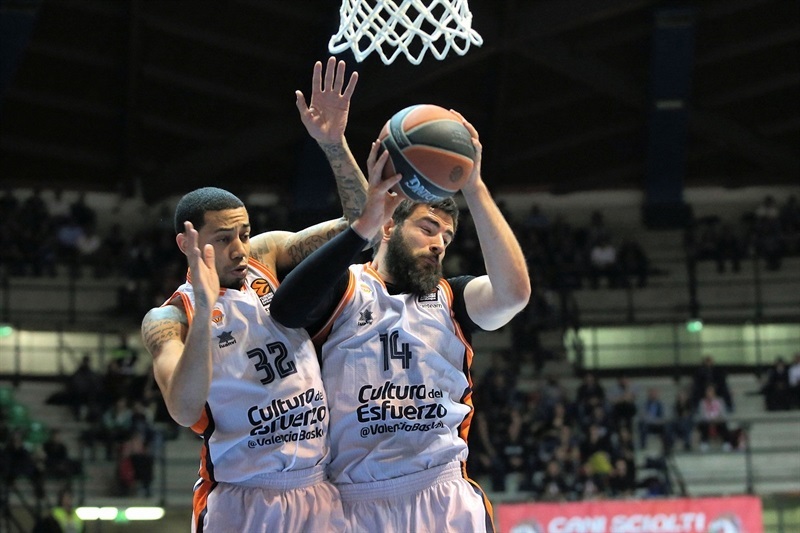 However, Valencia survived the comeback as Erick Green netted 18 points, while Tibor Pleiss had 11 points and 8 rebounds. 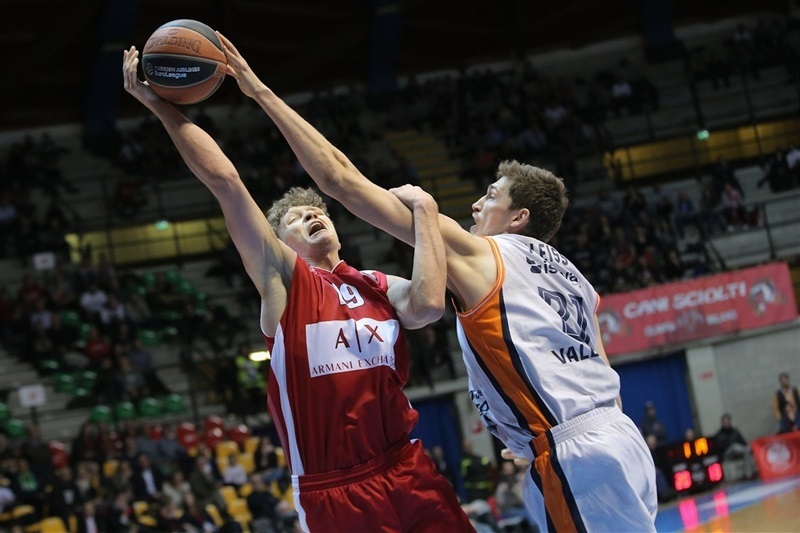 Sam Van Rossom and Bojan Dubljevic also had 11 points apiece in victory. For the hosts, Vladimir Micov starred with a career-high 27 points on 7-for-9 three-point shooting plus 5 rebounds and 4 assists. 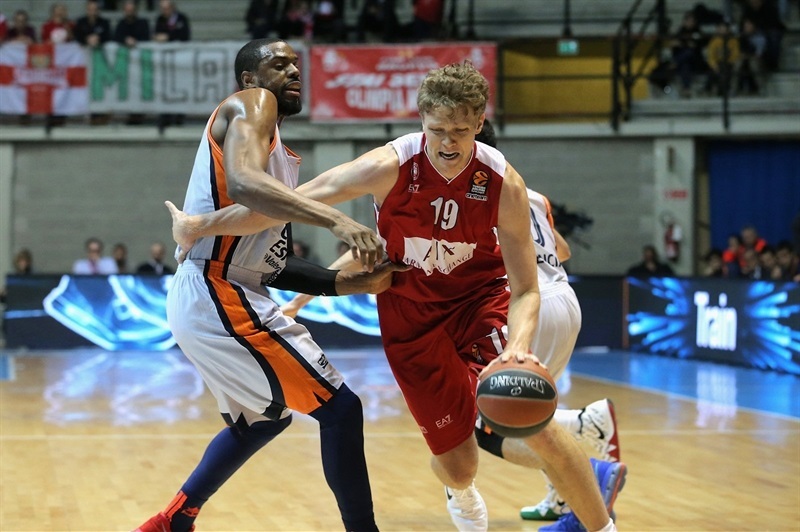 Jerrells finished with 17 points and Arturas Gudaitis had 13 points plus 8 rebounds in defeat. Rafa Martinez and Micov traded triples early on and Mindaugas Kuzminskas and Dubljevic exchanged close-range baskets to make it 7-7. A three-point play from Andrea Cinciarini put the hosts in front, before Gudaitis came off the bench to score a pair of put-back and a three-point play that opened a 20-11 lead. The visitors stopped the bleeding and scored the next 6 points, including a fastbreak dunk by Green, and Milan led 23-17 after 10 minutes. Van Rossom and Dairis Bertans traded triples to start the second quarter, before an alley-oop by Pleiss cut the difference to 26-24. 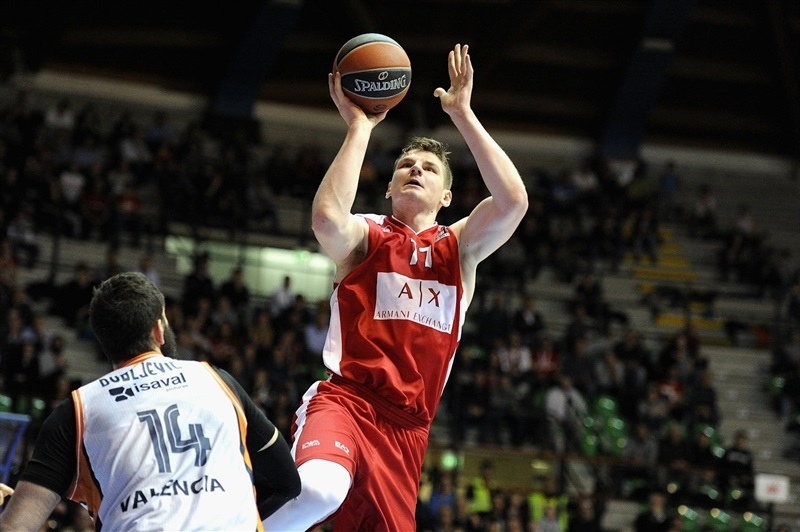 Milan got triples from Bertans and Amath M’Baye, but Van Rossom and Green answered back from long range to tie the game at 32-32. 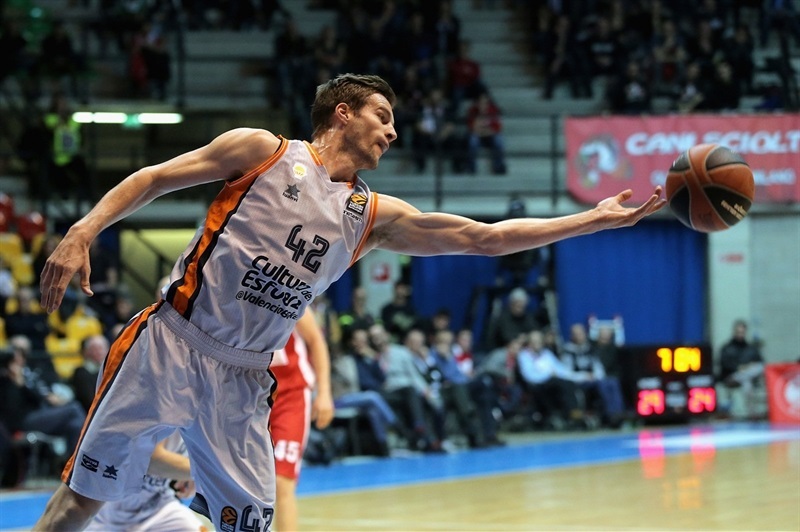 A third triple from Van Rossom put the visitors in front 36-37, but only briefly before dunks from M’Baye and Kaleb Tarczewski assured Milan took a 43-40 lead into halftime. 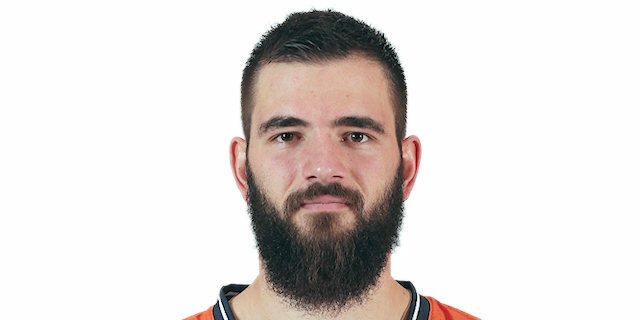 Micov opened the second half with a triple, but a pair of baskets from Dubljevic sparked a 2-14 run during which Joan Sastre nailed a triple and Will Thomas a mid-range jumper to make it 48-54. 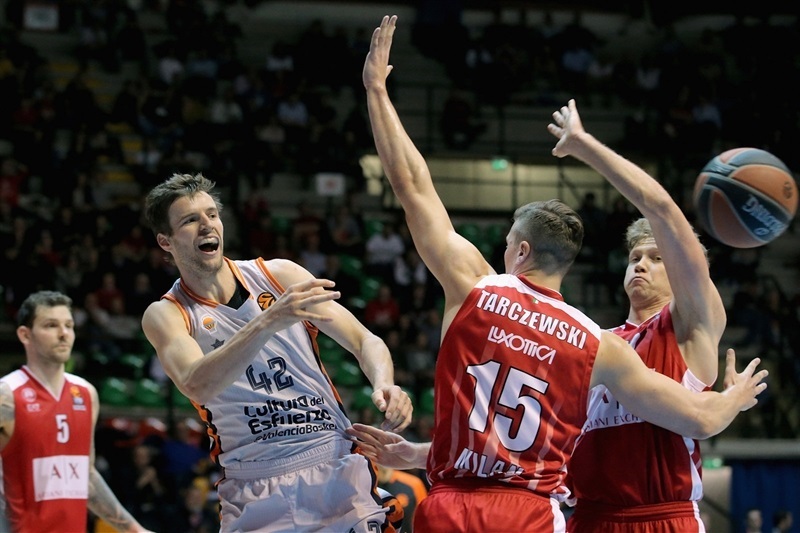 Milan was held without a field goal for almost five minutes until Micov hit back-to-back threes that halved the deficit. His second set of back-to-back triples put the hosts up 62-59. But Valencia caught fire from downtown, too. Green and Aaron Doornekamp exchanged threes. Soon after, Kuzminskas and Fernando San Emeterio traded threes, before Green beat the buzzer to make it 65-68 after three quarters. Green’s four-point play made it 67-74 after 64 seconds of play in the fourth quarter. 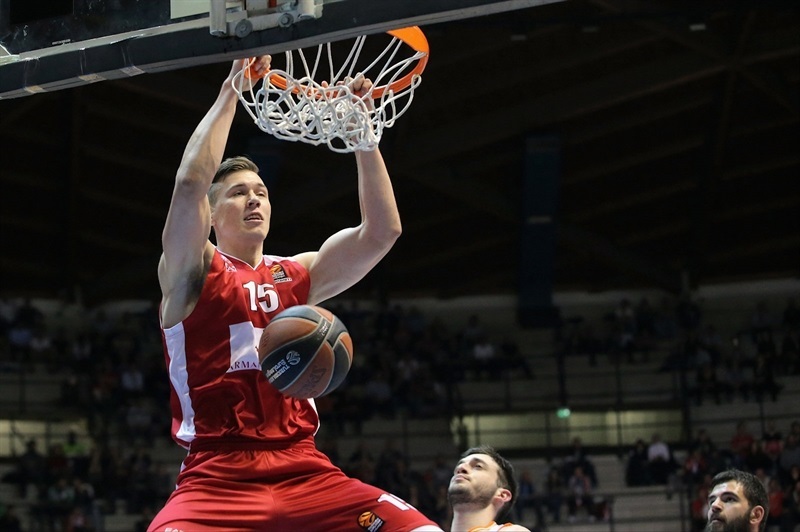 After baskets from Micov and Jerrells, a pair of close range buckets from Pleiss and a second-chance three-pointer from Doornekamp opened a 72-81 margin. Pleiss extended it to double-digits midway through the fourth, but Milan rallied as Jerrells nailed 3 triples in less than two minutes. 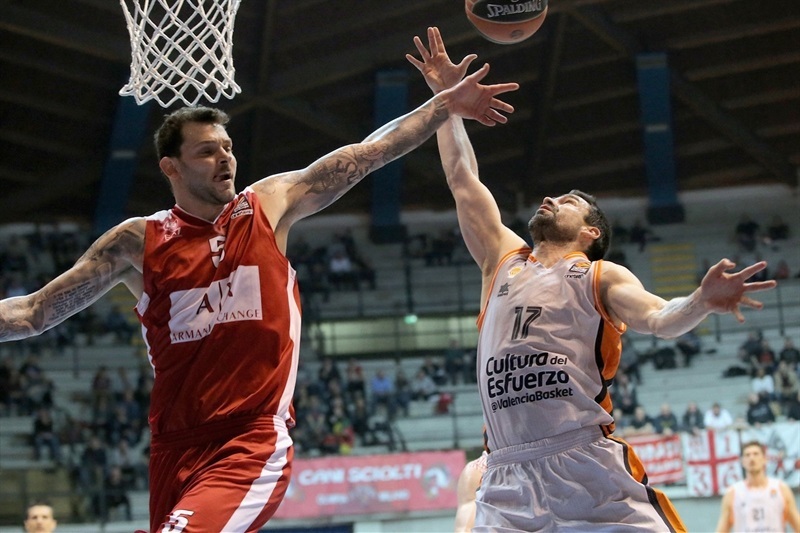 Micov’s seventh three-pointer and a runner from Gudaitis made it 89-90 with 41 seconds to go. Milan had a possession to take the lead, but Jerrells committed a turnover. Alberto Abalde only split free throws, but Doornekamp pulled down an offensive rebound after which Abalde made both fouls shots, sealing the outcome. 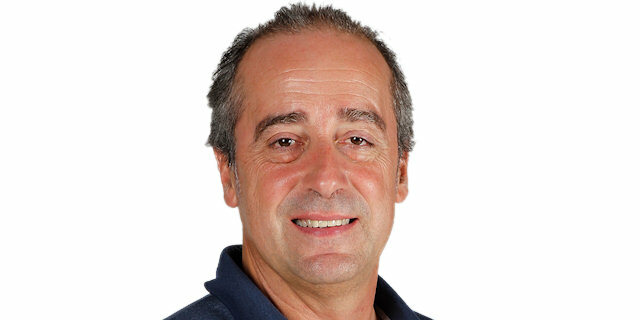 "It is a mirror of our EuroLeague season. We had many players who had 50% chances if they will be able to play or not tonight. In the first half we deserved to have a bigger advantage, but we missed easy set shots that we built, and which would have given us confidence. We missed open shots in the second half, too, and they went on to finish fast breaks on the other side. They had more energy, and fast breaks and offensive rebounds gave them a gap. But our guys are working. We are trying to bring and build a mentality. We got into situation and had a possession to win the game, but we made another mistake. For a team that is not playing in the playoffs, we are a team with most tight games." "For us it was a very good game. We controlled the rhythm in the first half, but did not control defensive rebounding, and that was the main reason for Milan’s small advantage at halftime. They got 10 offensive rebounds in the first half and had a 3-point advantage. Our second half was really good in defensive rebound situations, we ran and took first advantages on offense to score. They got only 3 offensive rebounds in the second half. We held an advantage of 10 or 11 points, but Micov and Jerrells were great with shooting three-pointers. Alberto Abalde scored an important three-pointer for us, and Doornekamp’s offensive rebound was the final key to this win." " It is a big win for us. Most important about it is that it is a win on the road. It is hard to play in this rhythm and that makes the win even better."